This book aims to show the factors influencing the construction (or reconstruction) of the collective Dayak identity, and why that identity is becoming so important in the current situation in Indonesia. The discussion is focussed on three historical periods: precolonial, colonial, and Indonesian. The last of these subdivided into pre-New Order, New Order, and Indonesia New Era (Gus Dur’s) periods. The Indonesia New Era period is covered up to February 2000, based on the duration of the author’s fieldwork (July 1999 to February 2000). The author uses participant observation and in-depth interviews as data-collecting techniques in his attempt to explain the importance of identity. The Dayaks are viewed in two different settings: rural and urban. The author argues and applies the identity-building theory proposed by Manuel Castells (1997). Castells asserts three types of identity-building: Legitimising Identity, Resistance Identity, and Project Identity. 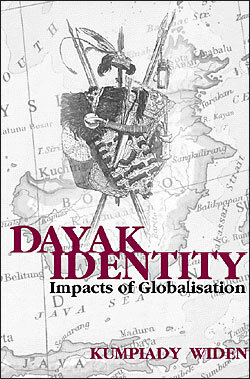 The effectiveness of Castells’s theory will be discussed in the context of Dayak identity-building. The current conflict between Dayaks and Madurese in Central Kalimantan is discussed in the conclusion, though it is peripheral to the author’s case, because it is a product of the transmigration project, one of the New Order regime’s development policies.